Mockingbirds are a favorite of mine. I captured this beauty outside my window today, perched on a branch of the Bald Cypress tree. 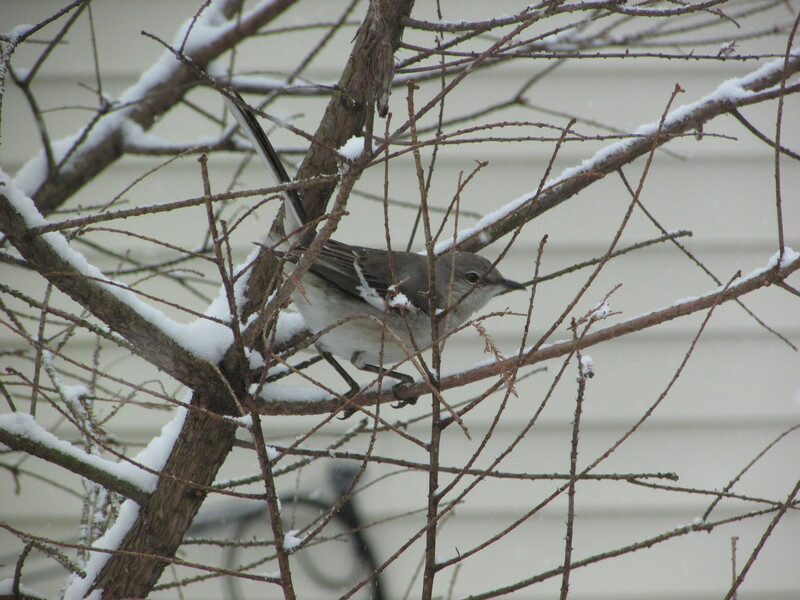 The beautiful snow is reason enough to gaze out the window, making eye-contact with a mockingbird is an added bonus. Is it possible to develop friendship with birds, moments of real trust? Possibly this morning was an inroad to even better relationships with the backyard flock. I trudged out in the snow to throw a bit of seed on the ground, and into the feeder hoping to give them a few minutes of nourishment before the snow covered my breakfast offering over again. This Monochrome Monday post is part of Skywatch. I liked the picture of the bird in the snow, nice to give the birds a good breakfast. I think they appreciated it. Loved seeing the mocking bird and the snow in one color- very skilled artistry and photography at work. Thanks for the link Susie. I saw that I have followed this blog, but I follow so many I often miss good things. What a beautiful blog. Isn’t it ? Sometimes, we need to work as networkers and join people together in this world, Kathy- don’t you think so? Yes, Susie…I do. One of the joys of blogging is meeting people from all over the world. Something that would have been hard before the age of technology. He (she?) looks a little like one of my brown honeyeaters, but a little plumper. The songs the bird sings are some of the sweetest. He can mimic all the backyard birds and often does so, always sitting at the top of a tall tree or pole. Thanks so much. That photo is beautiful!! And I did not realize there was someone picking up the word a day after wordpress quit….that is awesome. I might have to check that out. If you go to Cee’s list of challenges you can find quite a few good challenges still running. There is a link at the bottom of my post today to the list. Thanks so much for visiting.